It’s National Pizza Day, in these United States. One seems to get around a lot, visiting all of these distaff corners of New York City, and always traveling either on foot or by Subway or some combination of the two. It occurred to me, suddenly, to take stock of my “ABC’s” and figure out which Subway lines have escaped my camera. As it turns out, I seem to have zero shots of the “Z,” “L,” “6,” or the Staten Island lines in my library, and there doesn’t seem to be anything representing the Times Square shuttle in there either. I do seem to have most everything else, and will make it a point in the coming weeks to fill in the missing stuff. Hey… it’s not like I just ride the trains taking pictures… well, OK, I do that occasionally… I get these shots when I’m going back and forth to places. OK, this post is going to display a towering amount of nerd. A is for aardvark, I’m told. 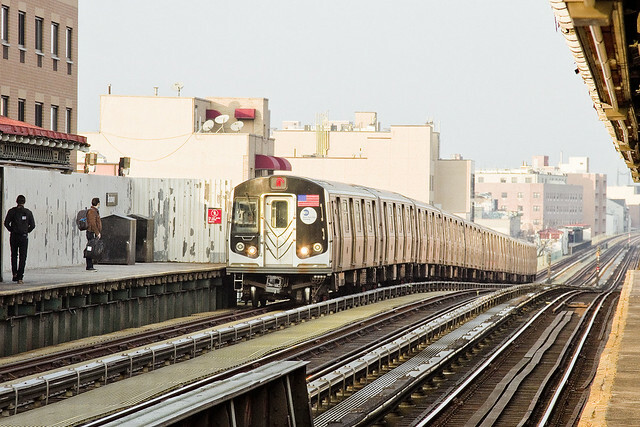 It’s also the designation for the IND Eighth Avenue Express of MTA’s B Division, and the A ranges between 207th street in Manhattan and either Far Rockaway or Richmond Hill in Queens – depending on its mood. Service on the A line started on the 10th of September in 1932. 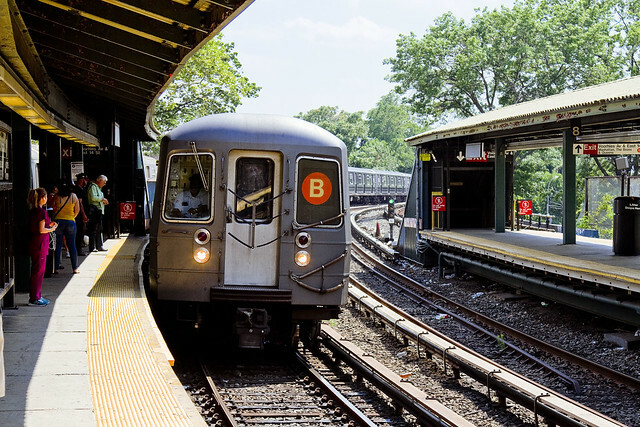 The B line, over in Brooklyn’s Sheepshead Bay Road station. Another IND line, the Sixth Avenue Express has an extremely complicated schedule that changes at seemingly random parts of the day and week. 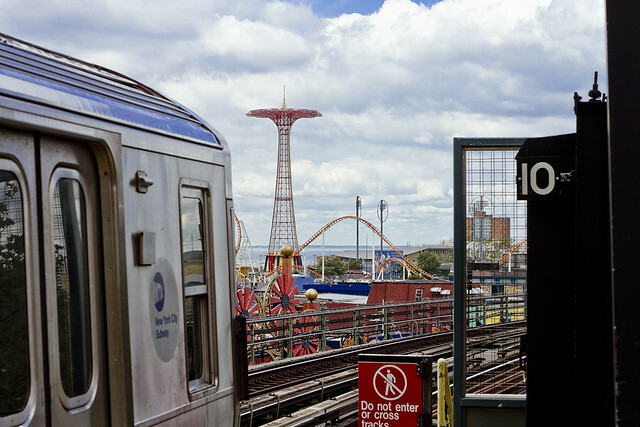 On weekdays, between nine in the morning and eleven at night it’s likely going to be somewhere between Brighton Beach in Brooklyn and 145th street in Harlem, but then there’s the rush hour exception which takes it to the Bronx. Service on the B line started on the 15th of December in 1940. It’s all very complicated, and B is Byzantine, and for B Division. The C, at some transfer station deep under central Brooklyn. Nineteen miles long, the route of the IND Eighth Avenue Local is. One end of the line is all the way uptown in Manhattan’s Washington Heights at 168th street, the other is at Fulton Street in Brooklyn. It’s also in the MTA’s B Division. 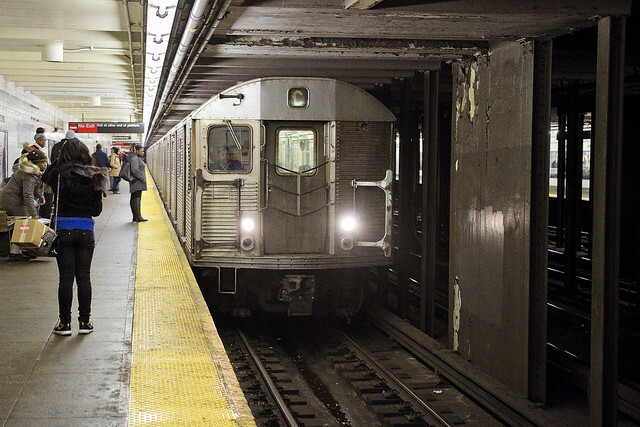 C is for counting the days until the MTA finally retires these 1964 era “R32 model” trains from service. Service on the C line started on the 1st of July in 1933. The D, out at Coney Island in Brooklyn. 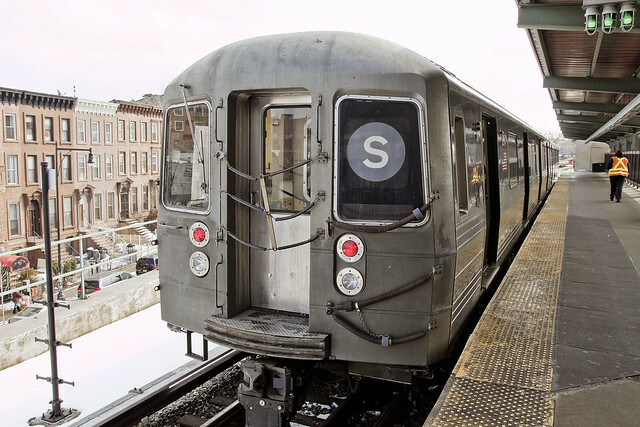 B Division, R68 cars, IND, incredibly long route to service – that’s the Sixth Avenue Express, or D train, at a terminal stop in Brooklyn, and the other end is found up in the Norwood section of the Bronx at 205th street. D is for “damn, there’s 41 stations on the D.” Service on the D Line started on December 15th, in 1940. 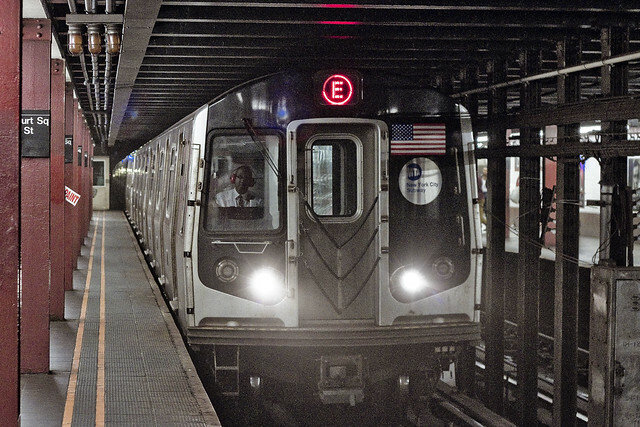 The E, rolling into LIC’s Court Square in Queens. Service on the E, or IND Eighth Avenue Local, line started on the 19th of August in 1933. It goes from Jamaica in Queens to lower Manhattan (with a couple of late night extras, depending on time and such) and is part of MTA’s B Division. 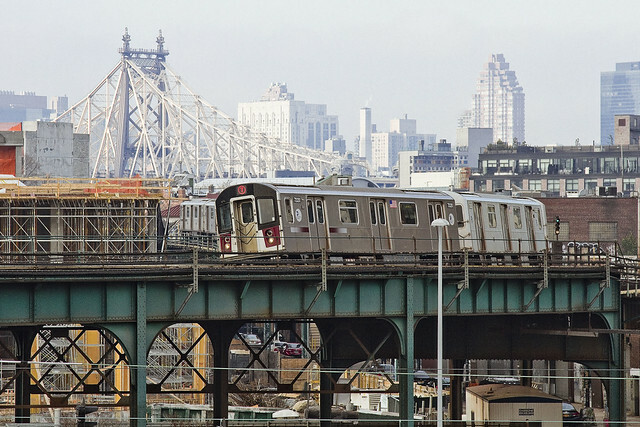 E is for “Express” when it’s running along the IND Queens Blvd. tracks. 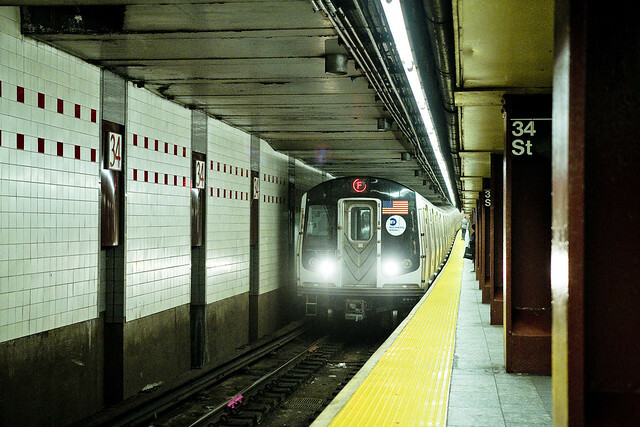 The F at 34th street, over in Manhattan. The G entering Smith/9th street, high over Red Hook and the Gowanus Canal, in Brooklyn. 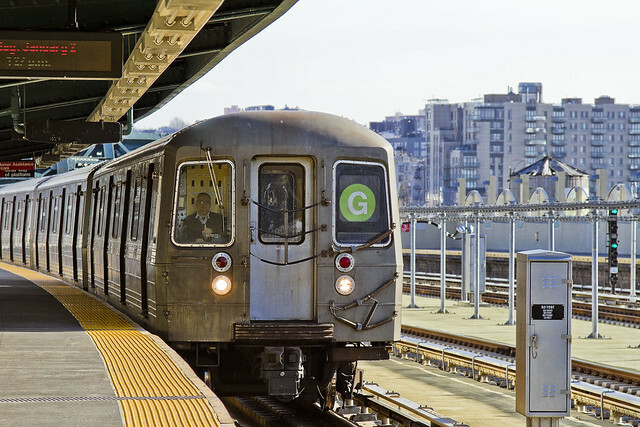 The G Crosstown Local is only 11.4 miles long, is an IND line in MTA’s B Division, spanning from Queen’s Long Island City to Brooklyn’s Church Avenue. The G has 21 stations to hit, and opened for business on August 19th of 1933. A twofer, with the J and M side by side on the Williamsburg Bridge over the East River. A proper shot of the M, under Astoria’s Broadway. 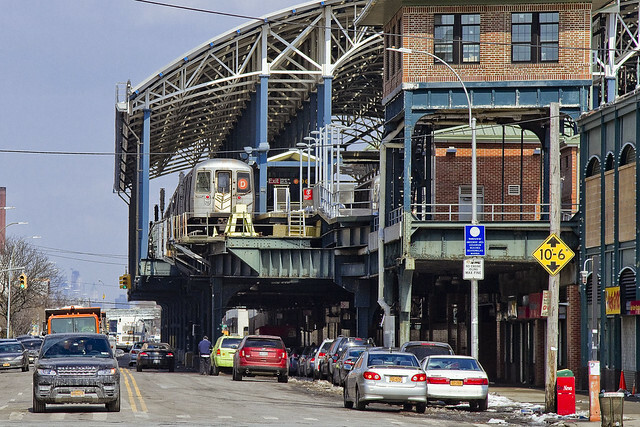 Also on Broadway in Western Queens’ Astoria, that’s the N entering its elevated station. The Q, at Brooklyn’s Coney Island. The R, entering Queens Plaza. The Rockaway Park Shuttle, out on some sandbar in Jamaica Bay. 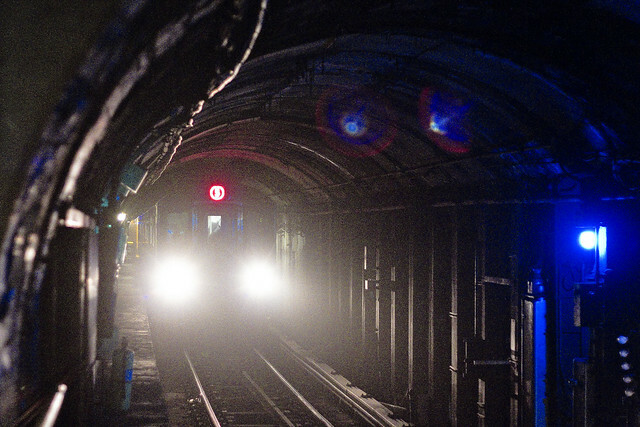 The 1 line, at 14th street in Manhattan. Moving between Van Cortlandt Park in the Bronx and Manhattan’s South Ferry, this A Division train started service on October 27th of 1904. It’s the IRT Broadway–Seventh Avenue Local if you ask the MTA. The 2 line, on elevated tracks in the Bronx. The IRT Seventh Avenue Express is an A Division line. 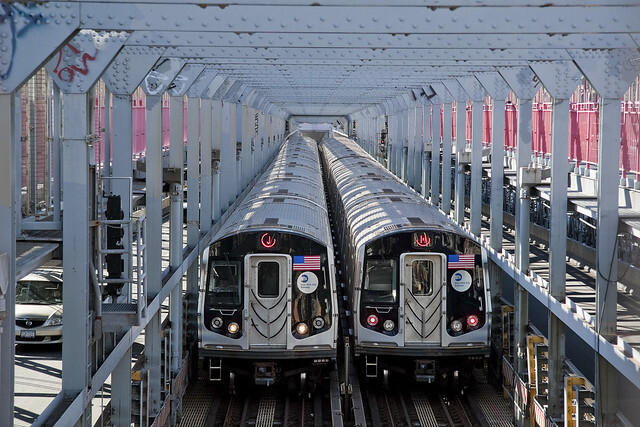 Providing service between 241st Street/Wakefield in the Bronx and the Flatbush Avenue Juction nearby Brooklyn College, the 2 covers 61 stations. 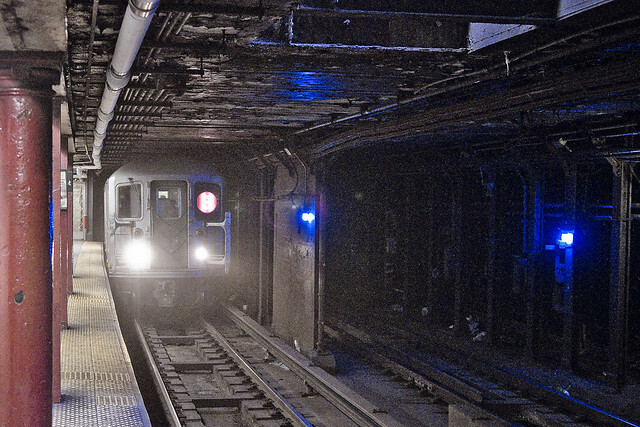 The 3 line, entering either the 72nd or 96th street station on Manhhattan’s Upper West Side. 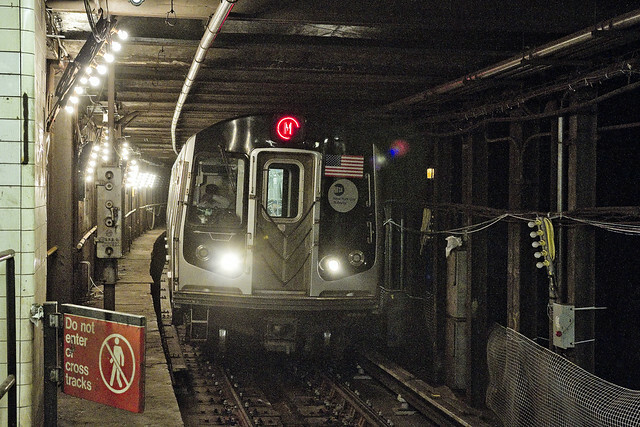 The IRT Seventh Avenue Express moves between 148th street in Manhattan’s Harlem and New Lots Avenue in Brooklyn. Service on this A Division line began in 1904, on the 23rd of November. 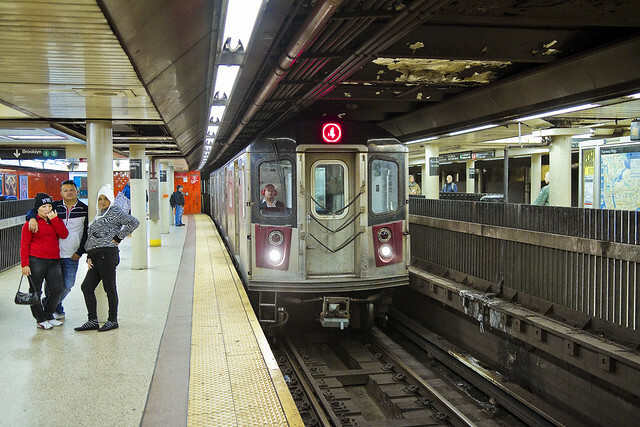 The 4, entering the Bowling Green station in Manhattan. That’s the IRT Lexington Avenue Express, an A Division line which services traffic between Crown Heights in Brooklyn and Woodlawn in the Bronx. Service began on June 2, 1917. That’s the 5, heading south into Manhattan’s 59th st./Lexington Avenue station. IRT Lexington Avenue Express, that’s what MTA calls this A Division line. 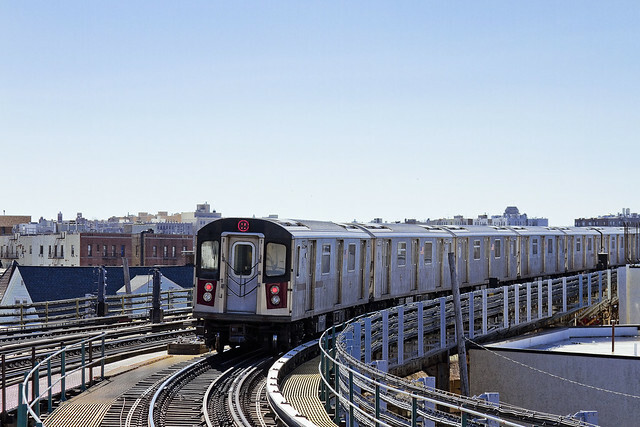 It’s another one of the lines which has differentiated routes depending on what day or time it is – but it goes from either Nereid or Dyre Avenue in the Bronx to Flatbush Avenue Junction or New Lots Avenue in Brooklyn after passing through all of Manhattan and services 45 stations. Service began on October 27th, 1904. Last – but never least – the most photogenic of NYC’s subway lines, the 7 as it curves out of LIC’s Court Square station in Queens. 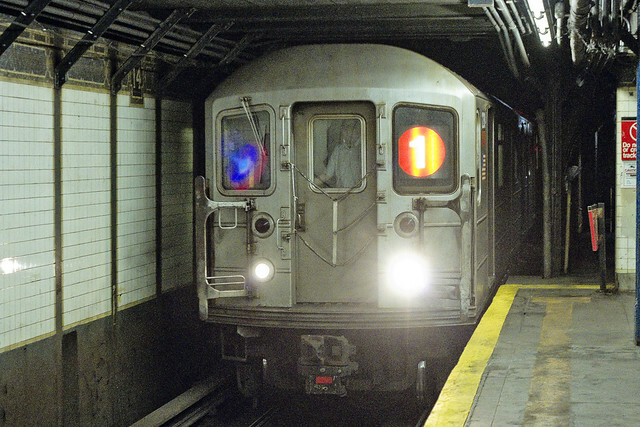 The IRT Flushing Local and Flushing Express are A Division trains, operating between Flushing in Queens and Hudson Yards in Manhattan. Service started on June 22 of 1915. 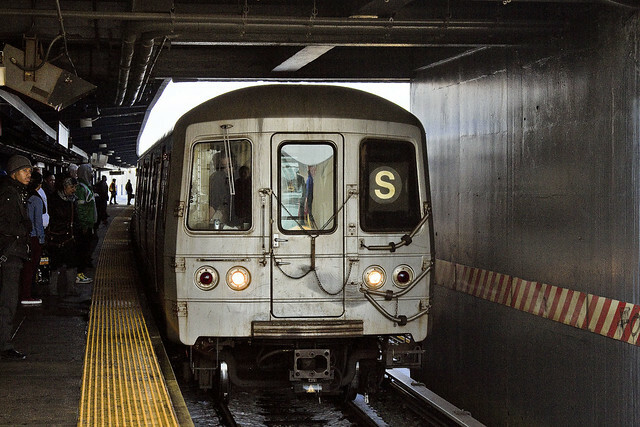 Now – it seems that I need to conjure up some reason to go to Staten Island, ride and photograph the L, Z, and 6 lines, then take that shuttle at Times Square… and then I think I’ve got them all… am I blanking out on anything – oh Internet hive mind? That might explain why I don’t have shots of it. 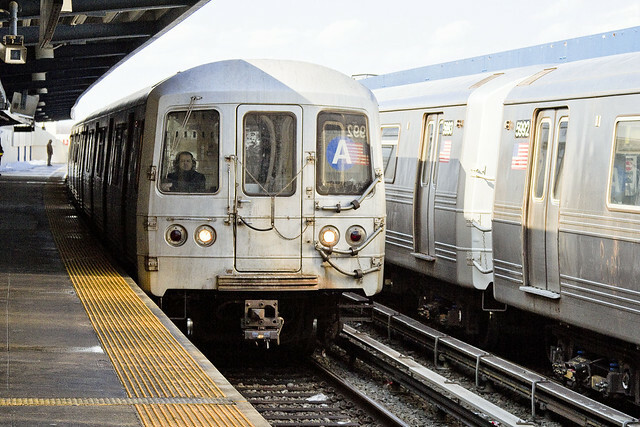 The Z certainly is in order, just very rare to see – it runs a skip-stop pattern in peak direction side-by-side with the J during weekday rush hour. That looks like the Rockaway Blvd station in the first shot, Welcome to the neighborhood. I wished you and your excellent camera and photographic skills came to the Lefferts station that has been going through an arduous transformation the past few years. 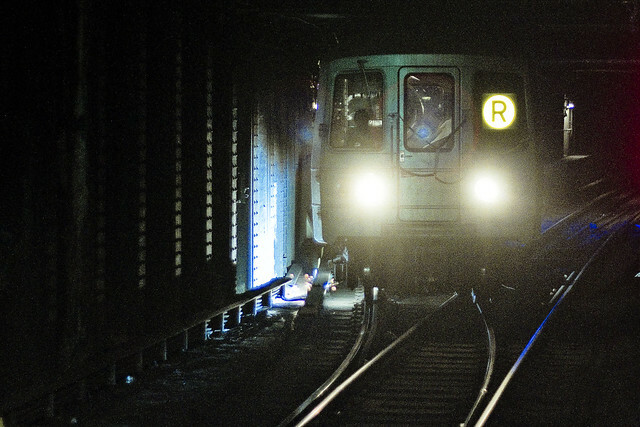 Fun fact about the Rockaway west line, the C local used to go there in ye bad olde days. The MTA decided to stupidly cut off this artery back in 1992.